I'd like to change my steering wheel. I've browsed the net a lot and have also looked up the steering wheel thread on here but I'm not convinced I really found what I'm looking for. I'm not really into the 4 spoke design but if you know something that stands out please post it. I'd like something not too flashy that would fit the era of the car properly. I'm not into suede mainly because I drive my car a lot and don't want my wheel to look like crap because I won't wear gloves most of the time. I like the momo mod 8 and monte carlo as well as the sparco 345 and most of the deep dish nardis. From what I've heard the ideal size seems to be around the 350mm range so that's what I'm mainly considering. I already have a momo hub. My budget is limited to 250$ max and I have no problem buying it used if I find something I like. I hope this will help others choose too. I'd like to hear your opinion and thoughts. Meurz wrote: Nardi Deep corn! Wow that really looks fabulous! New its priced at 350$ ish though, I'll see if I can find a used one for a good price! Thanks for the pic! +1 for the nardi , I love mine! Mostly because I have owned both. The styles are a little new for an ST185 (they are late 90's originally, I think), but they look good and are pretty subtle if that's what you are into. I have about 50k miles on an '05 Competition now and it looks pretty much new still, only slight pulling back of the leather at the seams with no other leather wear. They both look very nice too, though I don't really like the ring around the horn on the race wheel. I think it looks better without. The competition is very nice! polm wrote: They both look very nice too, though I don't really like the ring around the horn on the race wheel. I think it looks better without. The competition is very nice! The ring is a separate piece, so you can run with it or without it, with the horn flush with the face of the wheel or sticking out to match the ring. I normally make my wheel choice based on what my friends have for sale cheap. It looks pretty good, it has the center ring removable and it looks a lot more sturdy than those ebay knock offs. I have never heard of that brand before, but they make FIA certified seats and harnesses and that tells a lot. If their seats and harnesses are good enough for the FIA, their steering wheel has to be somewhat good I guess. It's a lot cheaper than a nardi or a momo but not too cheap that I'm scared of trying it. I think I'll pull the trigger soon and post feedback. There's absolutely nothing on the net about this steering wheel though. What are your thoughts about this? If they build FIA seats then I'd wager it's actually better than a Momo or Nardi. Buy mine! Then we both can get a new set up. 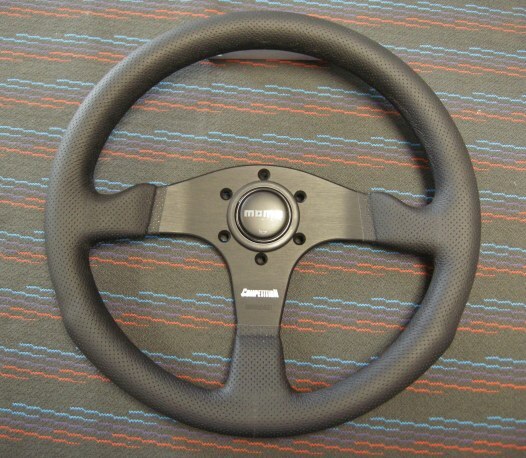 anyone ever tried a omp wheel? How do you remove the cruise control plug without damaging it? I'd like to install a Nardi leather steering wheel on my '91 All Trac. The airbag should be removed or there are hubs that allows me to keep the original airbag? How would you mount the airbag to a Nardi wheel? underscore wrote: How would you mount the airbag to a Nardi wheel? The correct answer could be: i can't mount the airbag to a Nardi wheel. But i've never done a steering wheel swap, so i wanted to be sure that i have to remove the airbag.